The “Bold and the Beautiful recap” for Friday, January 13th tells of Thomas inquiring about Steffy’s life, Wyatt delighting that his mother is finally being appreciated, Liam and Steffy talking about all the problems and obstacles they been through, and Quinn & Ridge having a showdown. 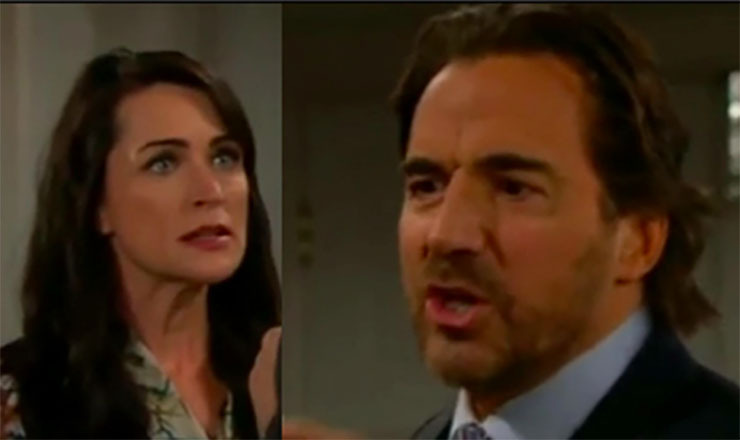 Quinn confronts Ridge She tells he that he’s trying to lead her down a path so she’ll ruin her marriage, so he could destroy her life. “Are you so angry and consumed with hatred that you would seduce your father’s wife?” she asks. Ridge says he’s the kind of son that would protect his father at all costs, and that’s why he has to get her out of Eric’s life. Quinn says that it’s too bad that he misjudged her, because when she tells Eric what he tried to do to her, he’s the one that’s going to get cut, cut out of the company and Eric’s life forever. Ridge says that he had her “this close” to falling. Thomas (Pierson Fode) is surprised that Steffy (Jacqueline MacInnes Wood) moved out of Liam’s (Scott Clifton) place. She says how it was disrespectful to Wyatt (Darin Brooks,) and she also has this image to uphold as the CEO. Thomas asks what is it means for her and Wyatt? Thomas says he’s just trying to figure Steffy out. He guesses Wyatt is still fighting for her. Steffy admits she was and any woman will be lucky to have him. She plans to pursue her future with Liam once the divorce is final. Later, Liam arrives and asks about symposium. She tells that she heard it went well. He encourages her to come home and they kiss. Liam says after all the problems and the obstacles they will end up together again. Wyatt gets a text from Quinn and tells Liam that the symposium was a success. Wyatt shows him a picture after Liam asks what’s going on. Liam mumbles that he supposes someone’s plan is working. Wyatt is elated that his mother finally getting the recognition she deserves. Liam is sure people will be seeing Quinn much more clearly after this. Wyatt tries to explain to Liam that it won’t change anything around there, and they are here to stay. He suggests Liam figure out a way to deal with the fact that Quinn is Forrester family. Liam says he’s right, which seems to frustrate Wyatt more. Wyatt walks out. Liam gets a call from Ridge, who assures him that by this time tomorrow, Quinn will be out of the picture. Join Joann’s B&B Facebook fan pages at: Team Hope Logan and Bold and the Beautiful Highlight Message Board.